Periwinkles are probably the last thing most people picture when they dream about a shellfish platter. However, if you’re serious about flavour and eating sustainable seafood then this little whelk will be a welcome addition at the dinner table. We would love more Victorians to discover how delicious they are. So, we’ve issued 9 General (Commercial) Permits to help explore whether we can develop a viable fishery and increase consumer awareness of this great shellfish product. The periwinkle General (Commercial) Permits expire in 2020 and the data collected during this period will allow us to assess whether it’s ecologically and economically viable to transition the fishery to an access licence. We caught up with Peter Riddle, one of our General Permit holders in the Western Zone, to find out why he’s excited about being a part of this fledgling fishery. Tell us a bit about your fishing heritage? I grew up in Hamilton Victoria then moved to Batemans Bay in New South Wales in 1989 after purchasing a commercial fishing licence. I then spent 8 years working as a professional fisherman chasing shark before I got a commercial licence to dive for abalone. Fortuitously, my boss then purchased an abalone licence in Victoria that allowed me to move back to my home state and work as an abalone diver. I’ve now been diving in Victoria for a total of 23 years. Periwinkles and whelks are a bit obscure – what got you interested in fishing for them? I have always noticed the high number of periwinkles whilst abalone diving. So, when an opportunity came up to catch them as part of a trial on a General (Commercial) Permit I jumped. Your son shares your passion for fishing. Tell us about that. My son, Mac, is keen. He started spearfishing with me when he was 10-years-old and he’s nearly 21 now! We both love the ocean so it’s very special to be able to share this passion with my boy. As part of the permit, I was able to list Mac as a second diver and he’s wasted no time getting to grips with periwinkle fishing. The periwinkle fishery in Victoria is divided into three zones: Central, Eastern and Western. We are based in Port Fairy and dive for periwinkles in the Western Zone that runs from the South Australian border to Warrnambool. What does a typical day in the office looks like for you? It all starts with a boat ride out to a spot we’ve picked based on weather and sea conditions. Once we’ve dropped anchor, we’ll then gear up and enter the water. We do a reccy before we start collecting so we can work out the places where there are lots of periwinkles and larger sized individuals. We’ll then start filling our catch bags. We’ll dive for around 4 to 6 hours and aim to retrieve around 200kg of periwinkles. Have you met any cool sea creatures on the job? To be honest, we don’t take a great deal of notice about what’s swimming around us because we’re so focused on searching and collecting periwinkles. The periwinkle fishery is an emerging one - why do you think the future is bright for you and Mac? I think it’s got great potential because periwinkles are in high abundance in many areas, we’re building up a regular market and we’re starting to see growth in the market as the interest in this shell fish increases. While it’s early days, my son and I are very optimistic that this trial periwinkle fishery we’re part of turns into an access fishery and that we can both get licences to grow it. 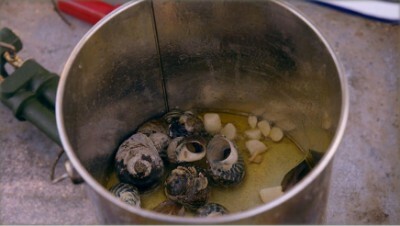 Some people are tipping periwinkles as ‘the next big thing’ in the foodie scene – do you think this is true. Chinese and Vietnamese communities already use periwinkles in many recipes, but other groups are a little slower to cotton onto just how good they can be. People like Matthew Evans (the Gourmet Farmer) have lifted the profile of periwinkles in the mainstream. However, if they featured on Masterchef I reckon the interest in them would go off the charts. Here’s hoping! Keen to give periwinkles a go? Periwinkles can be purchased at many fish markets across Melbourne. Fans of periwinkles reckon they pack more flavour and texture than clams, oysters and even abalone. Like most shellfish they’re best enjoyed live. For a delicious, simple recipe, check out Matthew Evans periwinkles in white wine and bay leaves here.